Changes | A Daily Dose of Zen Sarcasm! Even though I’ve only lived in DC for about seven years, the city has changed a lot. Understatement of the year, right? Whereas before you were warned, down to the street number, where you should not be venturing out AT ALL and ONLY IF YOU WERE MADE OF STERNER STUFF, these days we seem to focus on more exciting and bourgeois markers: restaurants sprout up left and right where before there were closed down storefronts and urban decay (the sad phenomenon, not the cosmetics). 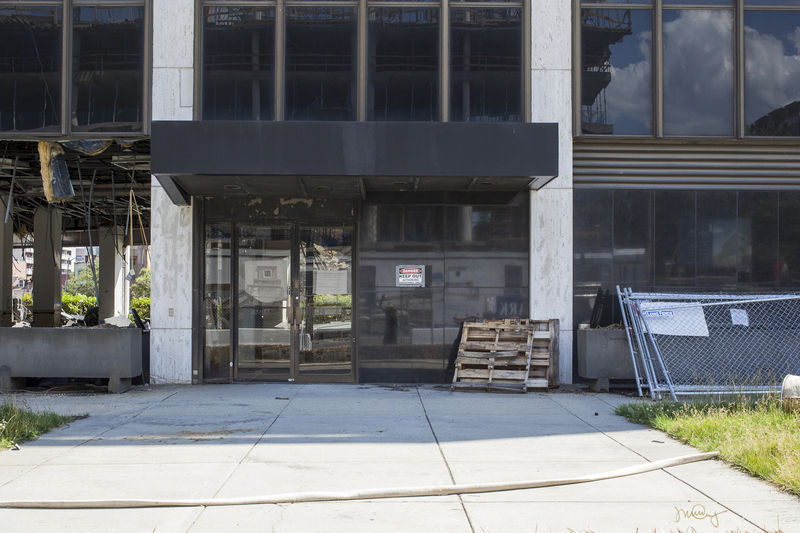 This is how the old NPR building looked as of Saturday, June 29. The demolition has started taking place over the last couple of weeks. I imagine, without doing any research whatsoever, that demolishing a building that took up an entire city lot but which also stood fairly close to other construction has to be done slowly and carefully, especially if there are any salvageable or reusable fixtures within. 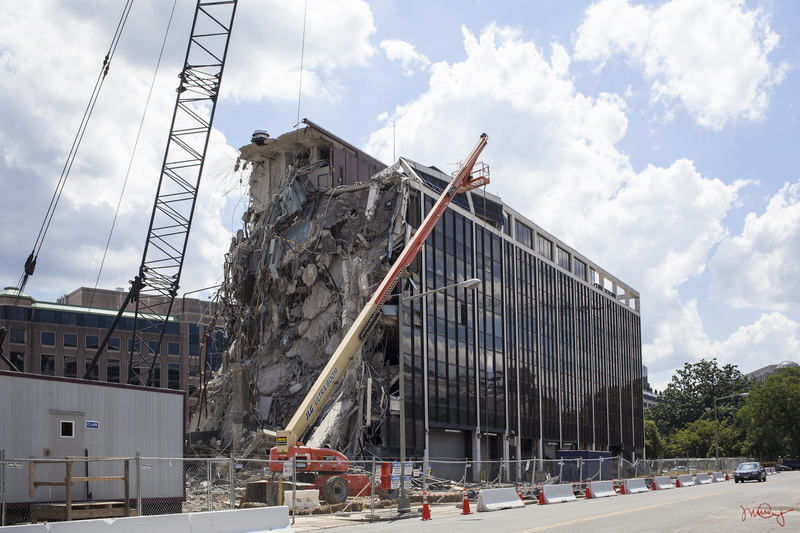 Somehow, when I heard that NPR was leaving for its shiny new headquarters on North Capitol Street (and oh, how shiny and new and efficient they are) I imagined the building would just house someone else. Surely a building is just a building, and it can provide shelter for someone else? Don’t we have older buildings than this one? But I suppose that’s the nature of all things, not just old buildings: everything comes and goes, and some things make more of an impression than others in our psyches. 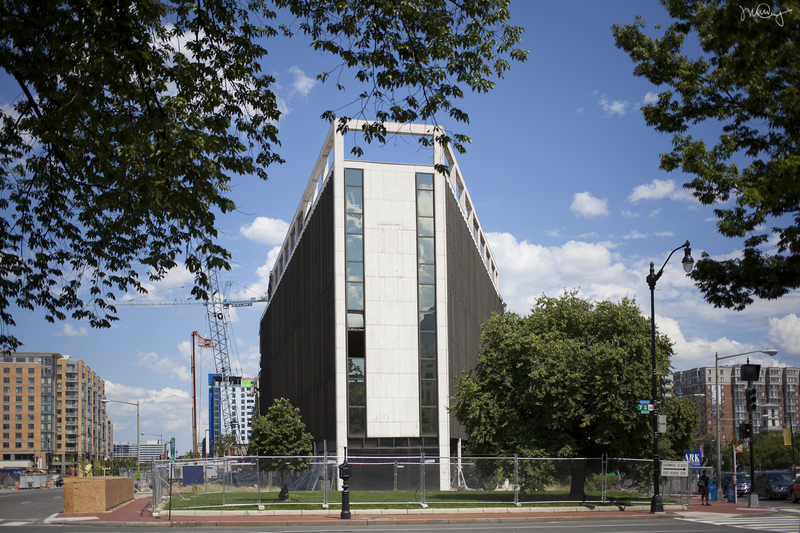 Maybe all the talk about the new NPR building and its shiny efficiency are just a polite and smart way of really saying that we’re all a little sad you left your stodgy little building, NPR. That we miss your letters. That we think your new expensive digs are a bit of a sell-out, because, let’s face it: organizing a media day so that everyone can see how pretty your new home is doesn’t totally suit you: it’s a little too much like bragging. It doesn’t go with socially-relevant stories told in hushed tones. I guess what I am really trying to say is that we’re having trouble adapting to change. In a few years, no one will remember this: it’ll just be a footnote. Maybe in a few more years, you’ll move to even shinier, even newer digs even farther east, and no one will bat an eyelash. 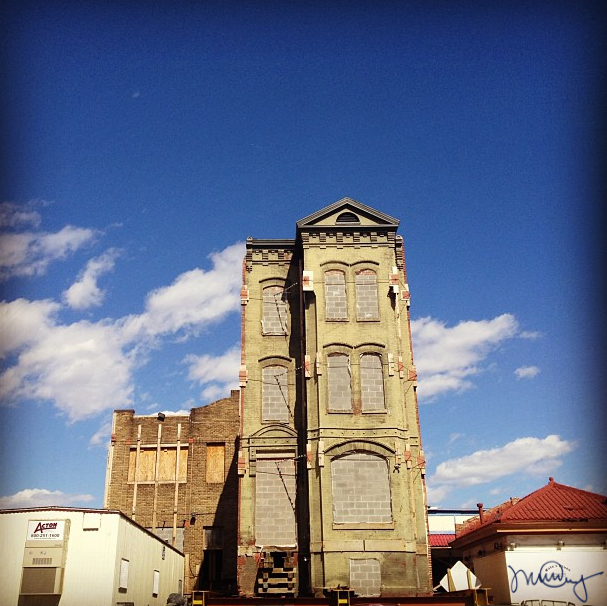 Then we will take pictures of another half-gutted building and feel just a little sad, and then move on. 1. I say “inconveniently placed” because of all the spots in the city where you would need to turn left or right into oncoming traffic during rush hour, this is one spot in particular where I think I would rather try maggot caviar or pierce a part of my body instead. Then again, I have actually done it and I’m still alive, so maybe I am overstating just how crummy this intersection is. Nah. 02 Jul	This entry was published on July 2, 2013 at 10:42 am. 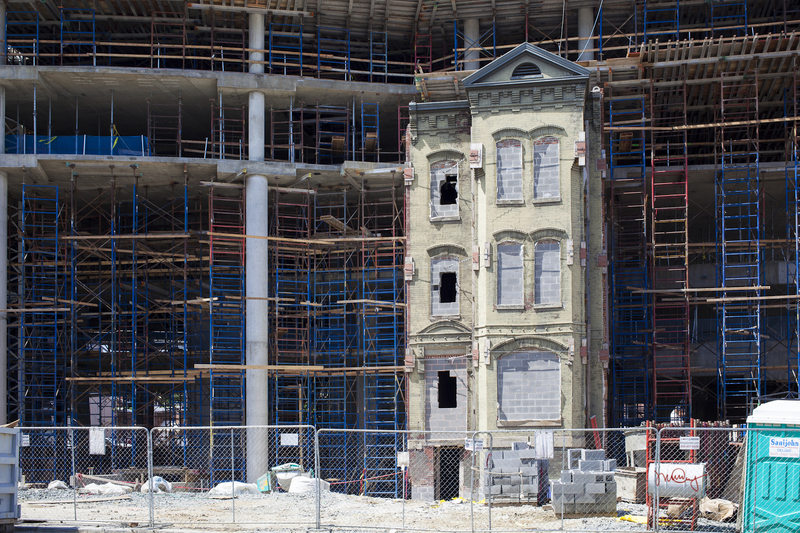 It’s filed under DC Dukkha, Photoblogging, Uncategorized and tagged Changes, construction, David Bowie, DC, demolition, documentation, K Street NW, new building, NPR, photography. Bookmark the permalink. Follow any comments here with the RSS feed for this post. Still stinging from the last time you told someone that some strange fascination fascinates you? Sounds like whoever that someone was is a person who doesn’t find much fascinating in their life and thinks all such fascinations should be eliminated. In other words, a narrow-minded person. We tend to identify our world by such things as the buildings, people, objects, and music in it. Home means passing by certain buildings along certain streets to our place and seeing the same sights, hearing similar sounds, and having familiar scents greet us. Changes are greeted with sorrow, a sense of loss, and an interest in what new sights/sounds/scents will greet us until they also become familiar and simply become part of what is there. I don’t get out enough for Moncton to have become familiar to me again. I still look at what are new sights to me and marvel at the changes. For the family and friends who stayed here, none of these sights are “new” any more and they are surprised when i comment on them. Yet, I think it’s important for me to do that. It reminds my friends and family of the changes and makes them look again at familiar sights. In a sense, it shakes up their world view and temporarily lifts them above the humdrum state of life. I think we all need that.